On a steamy October Saturday that felt more like August, Haverford College inaugurated the presidency of Stephen G. Emerson '74. A physician-scientist whose undergraduate years were marked by the breadth of his academic interests (he double-majored in Chemistry and Philosophy), Dr. Emerson is only the 13th president in the College's 174-year history. His inaugural speech invoked themes as diverse as the Enlightenment and stem-cell research as he expressed a vision for his administration that emphasizes core values and shared – and sharing -- experience. "The belief that there do exist truths that can be Learned, that wisdom can be gained, by searching for the deepest, most powerful, most axiomatic principles, achieved through seriously struggling and debating with one's colleagues, is truly a Core Value of the College. That is one reason why neither the College, nor any of its Departments or Centers, need be large. The important point is that the members of College as a whole, and each of its units, continuously seeks together to ask the most critical questions through the most penetrating and genuine approaches. Depth, not breadth, dialogue, not isolation." The crowd of more than a thousand – including 124 delegates from colleges and universities nationwide – swelled far beyond Roberts Green, where the College stages its Commencement. Indeed, similarities with Commencement were more than meteorological. Just as the annual May ceremony honors past achievements as it opens the door on new beginnings, Saturday's events acknowledged legacies even as the Haverford community looks forward to a dynamic and energized period of growth that, in Dr. Emerson's view, will take its cues from touchstone moments in College history. "Isaac Sharpless virtually recreated the faculty with eminent scholars in the 1880s. President Gilbert White rebuilt and expanded the College faculty after WWII, seeking out gifted researchers in the Arts and Sciences such as Marcel Gutwirth and Ariel Loewy, each of whom built radically new programs built upon the most serious inquiry and research. 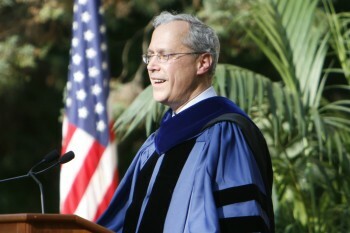 And most recently President Tom Tritton led the faculty in organizing three new interdisciplinary academic Centers, in the Humanities, Peace and Global Citizenship and the Integrated Natural Sciences, each of which links students and faculty in the work of research and scholarship, searching for new sparks of truth shared between individuals and disciplines." Given his background as an experimenter and intellectual entrepreneur, the selection of Dr. Emerson signals a willingness on the part of the College's Board of Managers to consider fresh and innovative approaches to new and challenging issues such as tuition costs, diversity, academic enrichment and campus master planning. "The excitement about Steve's appointment as president has only grown since our decision in February," noted Board Co-Chair Barry Zubrow '75. "The energy, drive and intellectual questioning that Steve brings to the job has been refreshing. I know that everyone shares an excitement and optimism about the opportunities for Haverford under his leadership." Dignitaries included dozens of familiar faces such as former President Jack Coleman and retired Philosophy professor Aryeh Kosman. Following the ceremony, the Treme Brass Band (direct from Donna's Bar & Grill in New Orleans) led the crowd to a reception on Founders Green that honored the man who compares Haverfordians to the stem cells he has spent decades studying. "Stem cells need to be nurtured in particular microenvironments, where they are educated by their surrounding cells in the niche. Stem cells educate their surrounding cells that provide their own education, and they work best when they sense and learn from other stem cells. "So without even much of a metaphorical stretch, I believe that Haverford College is, indeed, a source of the most important stem cells for our world, the students whom we have the privilege of learning from and training. Our students, through their lives in a Community with deeply engaged faculty and staff, are steeped in the most radical Learning, they take continuing joy in the adventures of Discovery, through which they engage in and prepare for lives of Renewal for the world, and of themselves. Founded on shared principles of Quakerism and the Enlightenment, the Haverford College community will continue to explore, experiment and mold new approaches to attract, sustain and educate students whose lives will shine with the inner light that we all share. " Details of the week's festivities, including a video profile of President Emerson. Video: President Emerson addresses the crowd. Video: The presidents of the UPenn, Swarthmore College, and Bryn Mawr College extend their congratulations. Video: Members of the Haverford community welcome Steve.